Get rid of the mid-winter blues once and for all! The Heart of Wisconsin has Games! Wausau Wisconsin is the location for this dead-of-winter gaming convention where you can warm your toes and your dice. It’s worth the trip to attend ans has been a long running con. Their new location holds great promise and the list of games is always expanding. This might be the best way to beat the mid-winter blues! Over the last 16 years Evercon has grown from a small, school-run event with a handful of gamers to a 1,000+ attendee gaming convention. Evercon brings gamers from across WI and nearby states who gather each January in Wausau, WI so they can start the new year enjoying their hobby with like-minded, dedicated gamers. The convention features role-playing games, board games, fantasy and historical miniature gaming, collectible card games, and video gaming. 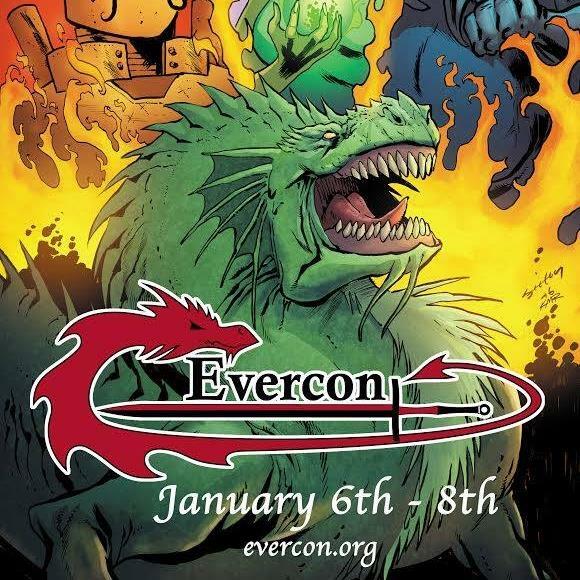 Evercon is for the fantasy and sci-fi gaming enthusiast. Evercon features a Dealer Hall, Artists and Authors, and some of the best gaming you can find to start the new year off right. If you are a gaming fan, don’t miss out on Evercon! Join me this year in attending, Fail Squad Games has a vendor table and Lloyd Metcalf as a special guest! Click here to check out their Tabletop page.